My friend Jo, made this recipe as part of her "Dish Do-Over" series on Steven and Chris. 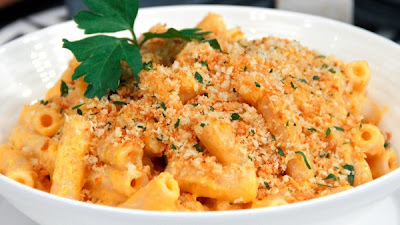 I love mac and cheese, and am always looking for really good recipes which may be used as alternatives to the really unhealthy kind. Yes, sometimes I want the gooey cheesy unhealthy kind, but sometimes I want something that is similar and just as comfort-foodie, which isn't as bad for me. Enter this recipe! It isn't exactly like the traditional mac and cheese (how could it be?) but it's REALLY GOOD and rich. This ain't one of those healthier mac and cheese recipes with no flavour. Don't you just hate that? Why would anyone eat something with no flavour?! Anyway, this is a great recipe. When I made it, I ended before the crust/baking part, because I prefer mine without a crust. But you may do what you wish. :) Seriously, it's totally yummy! Place sweet potato into a steamer basket over a saucepan of boiling water. Steam potato until fork tender, about 15 minutes. Mash until smooth and set aside. Heat oil over medium heat in a medium saucepan. Add onion and garlic and cook, stirring frequently until onions are softened and translucent, about 4 minutes. Add flour and cook, stirring constantly, for about 1 minute. Stir in mustard powder and sweet potato. Whisk in milk and chicken stock until smooth, and bring to a gentle simmer and cook, stirring frequently until thickened, about 5 minutes. Off heat, gradually stir in cheddar and ½ cup parmesan cheese until smooth. Season with nutmeg, hot sauce, salt and pepper. Whisk in Greek yogurt until mixture is smooth. Meanwhile, bring a large pot of salted water to a boil and cook pasta according to package instructions for al dente. Drain, reserving ½ cup pasta cooking water. Return pasta to pot and stir in sauce, and reserved pasta cooking water if needed. Season with salt and pepper to taste. Transfer to a 9x13-inch baking pan misted with cooking spray. In a small bowl combine panko, parsley and remaining parmesan cheese. Sprinkle mixture over pasta and mist with cooking spray. Bake for about 30 minutes until sauce is bubbling and topping is golden brown and crisp.